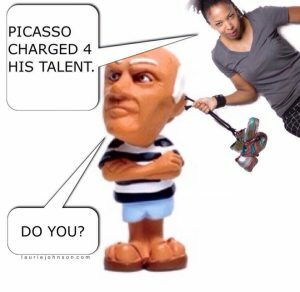 It’s you — Picasso, the great artist! Oh, please. You must sketch my portrait! I insist.” So Picasso agreed to sketch her. After studying her for a quick moment, he used a single pencil stroke to create her portrait. He handed the women his creation. So the question is… Are you charging for your experience? For those of us in the entertainment industry, it’s important to remember: it’s called show BUSINESS for a reason. You’ve got to manage your career like a business and you can’t let your passion for your art get in the way. If you live for show business, you must get paid for show business. Your experience says a lot about your value, but at what point do you know you’ve paid your dues? You gained experience when you performed for free. As artists, we’ve all done our share of non-gratis work. Performing at benefits, charity, or community events are wonderful. They are unpaid performances. And that’s okay. It’s a great way to establish a name for yourself and generate publicity. However, you can’t make performing for free a way of life. You have to place value on your experience. Some underestimate their worth and experience. Others may simply feel uncomfortable charging. Just because you’re willing to perform for free, doesn’t mean you always should. To sustain a career, gain respect, and survive in the entertainment industry, you must charge for the value and experience you provide. Experience has value. Don’t underestimate yours. You deserve to be paid. If you’re a specialty performer such as a stilt walker or silk artist, your talent is unique and is not easily replicated. You’ve got an advantage. Twenty years of performances, rehearsals, time steps, pirouettes… and sweat. It’s the learning you’re being paid for. So go ahead and charge for your experience. It’s what got you where you are today. And if your desire is to earn a living sharing your craft, then you have to. If you’re independently wealthy and money doesn’t matter, that’s awesome. What’s your take on this? Under what circumstances should performers get paid or work for free? Want more articles like this? Click here to receive my weekly newsletter!